Starboy has been feeling the need for lots of one-on-one interaction and play lately. Yesterday he hit me up to make some more fairies. I wasn't in the mood. 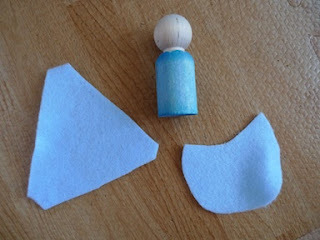 So we made some gnomey peg people. 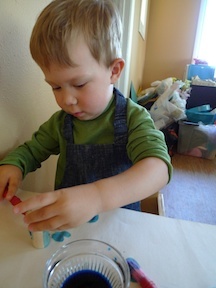 First, we painted the peg bodies with watered-down liquid watercolors. 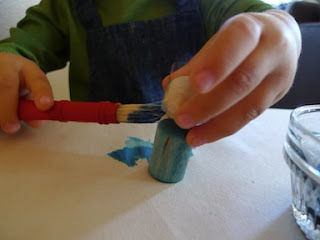 You can get pegs at the craft store or at wood products shops online. These pegs have a 7/8" diameter and are about 2 1/2" tall. You can get much larger ones as well. I think these about run 50c-$1.00 each. The painted body and eyes idea came from the gorgeous fairy garden party blog entry by Cathy Gaubert. 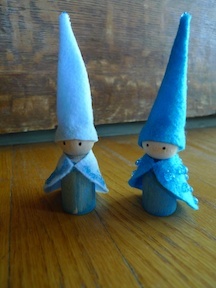 There are a zillion lovely ways to make peg people, as you can see in my Pinterest collection. But this was sort of last minute, so I went the easy route, with the paint. We covered the head and face of the peg person with tape so he wouldn't get painted. Somehow, when my back was turned, a brush flopped around and one of the peg heads got painted anyway. Of course. Luckily it was in sort of a balding man hair pattern, so it worked out okay. 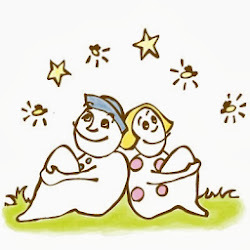 Starboy painted very carefully, and chose the color. We used the clothing pattern from Wee Folk Art. Her peg people are gorgeous, with hand stitching and fine detail. Starboy didn't have the patience for that, so I used a hot glue gun rather than a needle and thread. Rolling the hat was tricky: I used a straight pin to keep from hot-gluing myself to the hat. Starboy insisted that these gnomes needed glitter. 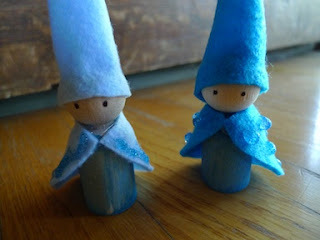 So we used glitter glue to decorate the tips of the hats and the capes, then set the gnomes to dry until morning. They turned out so cute! I love the detail in the more intricate designs, but for a good bang-for-the-buck project, I think this one is a home run.